She Builds Her Home: Adoption Home Study : What Is It and Why Do You Need One? Adoption Home Study : What Is It and Why Do You Need One? I think sometimes when you have read up about a topic, or you are doing something related to it, or you know someone who is, etc. you just know what everything means. Sometimes you forget that not everyone else knows what you are talking about! I have somewhat recognized that this may sometimes be the case with adoption. I know that every adoption looks different and there are many ways to go about it. Unless someone tells you every detail of their story, you probably won't know exactly what it looks like. BUT, with that being said, I think that I was a little bit naive in thinking that people are talking a lot more openly about adoption nowadays and I thought that a lot more people just knew all the ins and outs. I am realizing that this may not be the case, and I would love to be a helpful resource in sharing more about what adoption looks like and what the details of the process are. If you have heard anything about adoption at all, chances are that you have heard the term "Home Study" used at least a few times. 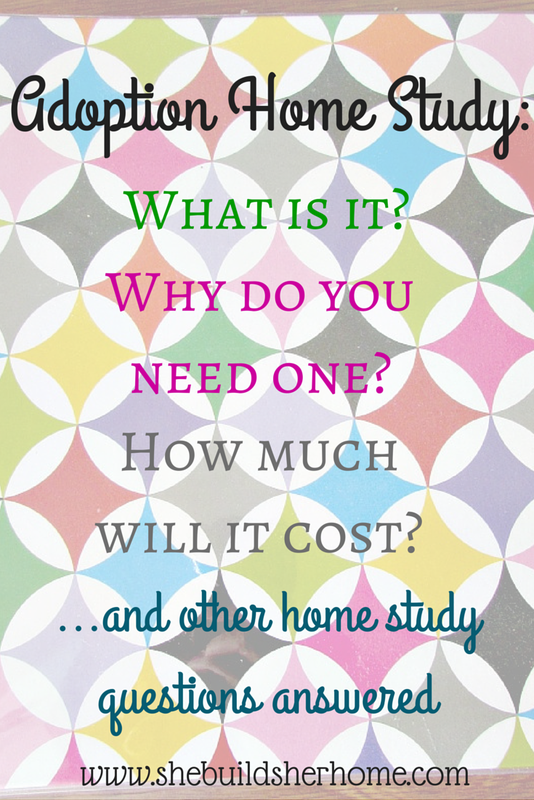 Though it may be a familiar term, you may not have a clue what a home study IS. The short answer is that a home study is the process of a licensed social worker going over many details of your life to determine if you are fit to become adoptive parents, and that it is typically the first step in an adoption process. The long answer is a little bit more. Read on to find out more about a home study and what it entails! So, what exactly IS a home study? A home study is, in some ways, exactly what it sounds like! It is a study of your home and life. The home study is the first part of the adoption process. Without it, you are not yet approved to bring an adopted child into your home! Typically, the first step in a home study would be finding a social worker to do it, if you don't have one already. Next, you will be collecting lots and lots of paperwork. You will need everything from your previous years taxes, to statements on your health written by your physician, to proof of insurance for the adopted child, to copies of birth certificates, marriage licences and much more. Our social worker gave us a very helpful check list, where I literally just went down it, collected the item and checked it off once I had added it to our folder. This will take some time because you will need to be calling doctor's offices or going in for appointments, tracking down licenses, asking your employer for letters of employment, collecting reference letters from friends and family, getting your fingerprints taken and background checks completed, etc. The adoptive parents will also fill out questionnaires with tons and tons of questions with everything from "how do you handle stress" to "what are your preferred methods for discipline". This helps your social worker to better get a feel for who you are, support systems you have, what your relationships are like, etc. You will also have an interview(s) with the person completing your home study. In ours, we told her about our family, life, marriage, and our reasons for wanting to adopt. Finally, your social worker will come to your home. Our social worker told us that the main purpose for this was to make sure that our home was safe. Not necessarily clean or up on the trends or anything like that, but just to ensure safety. For example, she checked to make sure that we had a baby gate on our stairs. She asked us to point out all of our smoke detectors and fire extinguishers. This step could very easily make you nervous, but there is nothing to worry about. They aren't going through all of your drawers and cabinets, looking at every last thing you own. They just want to see what your home is like and make sure a baby would be safe living there. Who completes your home study? Depending on your adoption process, this will be different for each family. If you are using a local agency, they will probably do your home study for you as part of your fees. If you are using a consultant, or an agency that is not nearby, you will probably find a social worker who does home studies. Your consultant or agency will probably have recommendations on reputable social workers for you. I believe, but am not 100% sure, that if you are doing a foster adoption, the state will complete your home study for you. This sounds like quite the process. How much is this going to run me? Again, this will depend on your process. Many agencies will include this in your fees. Many won't. What I have typically heard is that it can cost anywhere from $1000-$3000, depending on your area, type of adoption, etc. Ours was just under the low end of that, and we also had to pay our social worker's mileage for driving the 2 hours to our home and back. You will also need to do post placement visits with your social worker after the baby is placed in your home. This is typically not included in those fees. We are expecting at least another $1000 + mileage for the 3 visits we will do between the time our baby is placed and the adoption is finalized in court. How long is all of this going to take? I have found that typically, your social worker is going to try to get things done as quickly as they and you are both able, because until your home study is done, you are not officially waiting for a baby. You CANNOT bring a baby home until your study is completed. Our home study took almost exactly 3 months. It probably could have been a little faster than this if we had scheduled our first visit a little bit sooner, and without all of the holidays in there. Sometimes things get slowed down, like if your fingerprints don't come back right, etc. and I have heard of it taking up to about 6 months. I have also heard of studies being expedited and being done in a matter of weeks. It is all going to depend on how fast you can get your paper work done, visits scheduled, and what your social worker's load is like at the time. Ok, this all makes sense. But, why do you NEED one? We have had a few friends laugh about the fact that we need to "jump through all of these hoops" to adopt a baby. I agree that it is somewhat laughable, but I understand the need. For families like us, who already have children, it may seem silly to people who know us, know our character, know how we are raising our kids. But you cannot be too sure. You cannot be too safe when approving someone to adopt a baby. I get that any old Joe out there can have and raise a baby biologically without doing all of this, and I think that's what throws people off. The way I see it is, if you were going to give your precious child to someone else, how safe could you really be? How much would you want to know about them? How sure would you want to be that they weren't a criminal, child abuser, etc. It is not because the government or the birth parents or the agency doesn't trust you, it is because of the safety of the child. Once you are home study approved, you can begin the wait for your child! If you are working with a consultant, like we are, you can start applying to agencies and being sent possible matches that you may like to present yourself to. If you work with an agency, this is when you would be officially on the list of waiting families. In international, I believe this is when you would start working on your dossier to be sent to the country you want to adopt from. It is the crucial first step in this wonderful process to bringing your child home! We are very excited that we just received our approval last week! Do you have any other questions about a home study that I didn't answer? How about other questions about adoption or the adoption process that I could answer in the future?